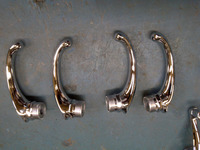 As you can see from the hood ornaments and these handles for a V16 Cadillac . I think he would be a good source for the Royale owners to have castings made. I need to have one interior door handle cast as the drivers door is missing. I'm going to talk to my local guy first but will give Mike a call. I have just sent Greg Coleman my 1932 Royals drivers side - exterior door handle to be cast and chromed. The cost is $150. Plus shipping. If you would like Greg to make one for you please make arrangements directly with him.